Ebook Access - How Many People Can Read an ebook at the Same Time? Ebooks have a lot of great imaging content. 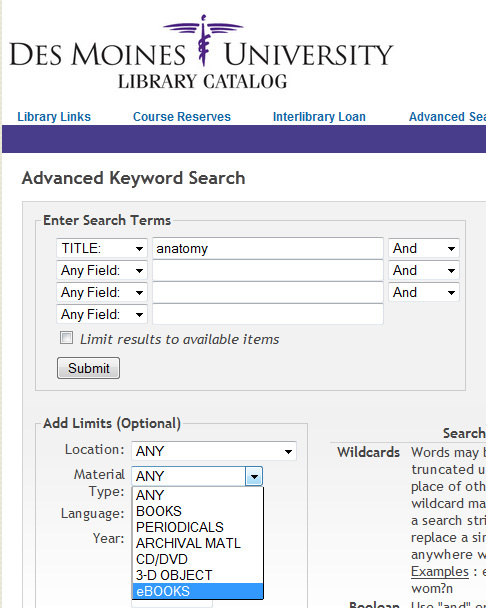 To find images, search the library catalog for your subject under the "Advanced Search" option and then limit the "Material Type" to "ebook." Do you have a favorite image from a print textbook? The library has a flatbed scanner. Remember to bring a flash drive - larger image files might be harder to send by email, but that's an option too! One popular anatomy series is Netters. Once at the Netter's Reference Collection, you can choose which ebook is most appropriate for your needs. Classic textbooks in anatomy and anatomical illustration. The library subscription includes: Clinical Anatomy, Concise Radiologic Anatomy, Online Dissection Modules, Atlas of Human Anatomy, and Concise Orthopaedic Anatomy. Please note the number of readers may access an ebook at one time. This information is included in the access field of the library catalog. If the note reads "single user" then only one person may read the book online at a time. If you see a note that reads "unlimited users" then all students should theoretically be able to read the book at the same time. Most library ebooks are not available for download, except for individual chapters.